The Hot Air Balloon Rodeo offers guests a spectacle like no other with a sky full of color. Get to the launch grounds early to see the balloons inflate and enjoy this wonderful photography opportunity. 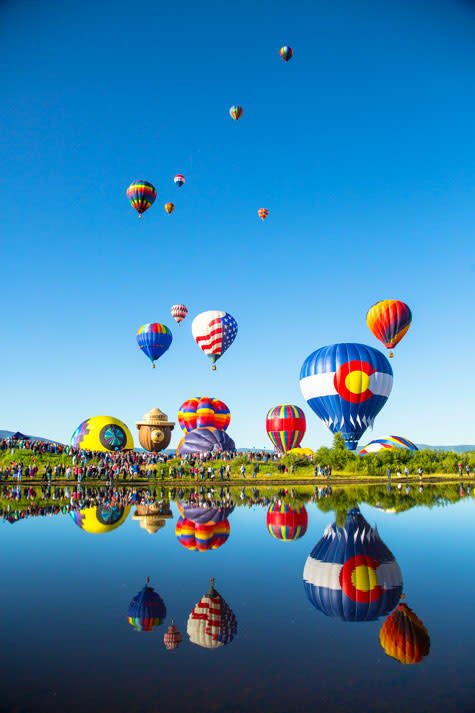 Once the balloons are in the air, sip on coffee, grab breakfast and visit with our local vendors as you watch more balloons dot the Yampa Valley sky. Just minutes away, another colorful scene awaits at Art in the Park, where arts and crafts, performances and an interactive children’s area will fill your day. Art in the Park is free to the public and features nearly 160 artist vendors, live entertainment, food vendors, and an interactive children’s art area. For additional info including location, times, and contact info to get involved in the event, please click here. On Saturday, the fun doesn&apos;t stop when the sun goes down. Head back to the mountain area and take in the colors as the balloon glow lights up on Mt. Werner. Spectators will have the opportunity to walk among the tethered balloons or take photos of this beautiful display from the numerous restaurant patios and hotel and condo balconies at the base of the mountain. Join the conversation and follow us on social media! You can find us on Facebook, Twitter, and Instagram, and can view photos of the event below. Please check back for lodging specials and save on your summer holiday! 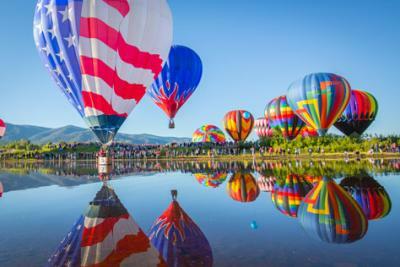 From the Hot Air Balloon Rodeo to Art in the Park, enjoy the most colorful weekend in Steamboat Springs. View the full calendar of events for Hot Air Balloon Rodeo weekend by clicking on the link below. Please continue to check back as more events will be added to the 2018 Weekend Schedule as they become available. Approximately 9/10 of a mile south of Walton Creek Road on Highway 40. The physical address is: 35565 South Highway 40 and the property is better known as the Bald Eagle Lake. Hot Air Balloon Rodeo: There is no public parking at the event. Free transportation is provided from the Meadows Parking lot on Pine Grove Road. Parking will also be free in the Meadows Parking lot. Transportation begins from the Meadows parking lot at 6:00 a.m. on Saturday and Sunday. There will be a suggested donation of $10 per car to help insure the longevity of the most colorful weekend in Steamboat Springs! Due to the event&apos;s convenient location on the edge of town, we encourage spectators to walk, ride their bikes or take the shuttle from the hotel or lodge. Parking along Highway 40 is strictly prohibited. No dogs are allowed at event site due to balloon hazards. 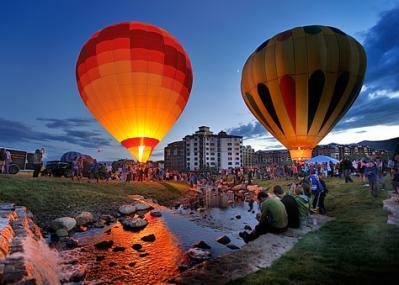 Balloon Glow: Ample free parking is available at the Mountain Village. If you are interested in participating in the Hot Air Balloon Rodeo, please contact Show Director Debby Standefer by calling 303-862-2869 or emailing debby@ddmarketingconcepts.com. For additional information on the event, sponsorships opportunities, and more, please contact Logan Molen, 970-871-4224.